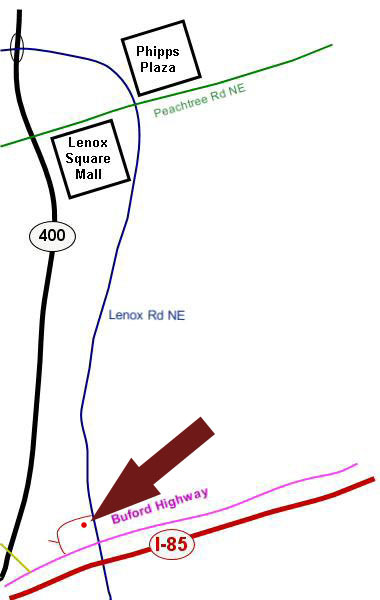 My office is at 49-C Lenox Pointe, a few minutes south of Lenox Square Mall where Lenox Road meets Buford Highway. This location is also convenient to Georgia 400, I-85, and I-75. Take Exit 88 (Lenox Road / Cheshire Bridge). Turn RIGHT off the exit ramp onto Lenox Road. then turn LEFT into Lenox Pointe. Townhouse 49 is in the first building on your left. Enter the elevator lobby inside the 49 B+C arch. Take Exit 86 for Lenox Road and Buford Highway. PASS all three right turnoffs. PASS 1st traffic light at Sidney Marcus Boulevard. Turn LEFT at 2nd traffic light onto Lenox Road. Turn LEFT into Lenox Pointe. Take Exit 251 for I-85 North. STAY in the rightmost (exit) lane. Turn LEFT off the exit ramp onto Lenox Road. Take one of the MIDDLE LANES labeled Lenox Road South. PASS Phipps Plaza, Peachtree Road, and Lenox Square. Lenox Road widens shortly before Buford Highway. Turn RIGHT into Lenox Pointe. Turn LEFT off the exit ramp onto Sidney Marcus Boulevard. Turn LEFT where Sidney Marcus meets Buford Highway. Turn LEFT at traffic light onto Lenox Road.